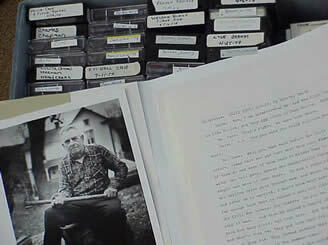 Records the reminiscences of Mr. and Mrs. Elzie Cave, who were born and raised in Dark Hollow, Virginia prior to the establishment of Shenandoah National Park in 1934. Mrs. Cave's full name is not given in the course of the interview, but an accompanying typed manuscript gives her name as Lula Breeden Cave. Describes their early home and family lives, schooling, marriage, holidays and community events. Among the topics discussed are farming, raising of livestock, local wildlife and the bark peeling industry. Includes references to Civil War ancestors, wakes and funerals, herbal remedies and the weather extremes of drought and record snows in the 1920s and 30s. Cave, Elza A., (Elza Alfred), 1907-1991, Interviews; "Cave, Lula Breeden, 1905-1984 Interviews"
Mountain people -- Blue Ridge Mountains -- Social life and customs; Mountain life -- Shenandoah River Valley (Va. and W. Va.) – History; Mountain people -- Virginia -- Shenandoah National Park -- Social life and customs; Rural poor – Virginia; Country life -- Appalachian Region, Southern; Agriculture -- Appalachian Region, Southern; Food habits -- Appalachian Region, Southern; Droughts – Virginia; Blizzards – Virginia; Folklore -- Shenandoah River Valley (Va. and W. Va.) – History; Holidays -- Shenandoah River Valley (Va. and W. Va.) – History; Traditional medicine -- Shenandoah River Valley (Va. and W. Va.); Funeral rites and ceremonies -- Appalachian Region, Southern; Bark peeling -- Virginia -- Madison County – History; Forest products industry -- Shenandoah River Valley (Va. and W. Va.) – History; Land use -- Government policy -- United States. United States -- History -- Civil War, 1861-1865 – Anecdotes; United States -- History -- Civil War, 1861-1865 -- Draft resisters; Dark Hollow (Va.) – History; Madison County (Va.) – History; Shenandoah River Valley (Va. and W. Va.) -- Manners and customs; Shenandoah National Park (Va.) -- History, Local"